On the morning of Monday 27th November 1944 an enormous explosion rocked the Staffordshire countryside. Near the village of Fauld a whole hilltop, an estimated two million tons of rock and debris, was blasted two thousand feet into the air leaving a crater a quarter of a mile in diameter and one hundred feet in depth. Deep below the surface some 4,000 tons of bombs stored in the RAF’s largest underground ammunition depot had exploded en-masse, destroying much of the depot, devastating the local landscape and claiming seventy lives. 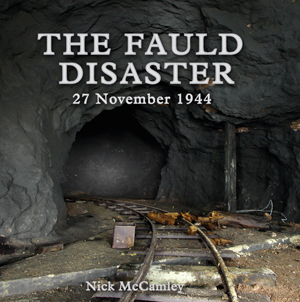 It is the definitive history of the RAF’s ill-fated excursion into underground storage during the Second World War, culminating in the disaster at Fauld. • A detailed overview of RAF ammunition storage policy through the inter-war years. •Illustrated history of the development, construction (and often the subsequent destruction) of the RAF’s five huge, architecturally breathtaking underground bomb storage depots, built in preparation for the Second World War. •The second half of the book explains the chain of events that led up to the disaster at Fauld, describes the moments before and immediately after the explosion in graphic detail and goes on to give a definitive account of the cause of the catastrophe based upon a forensic examination of the Air Ministry Court of Inquiry records and the subsequent civilian Coroner’s Inquiry. •Dramatic account of the largest, non-nuclear explosion the world has ever witnessed. •Detailed account of the background events (largely failings in RAF bomb storage and maintenance policies) that culminated in the disaster at Fauld. •Over two hundred previously unpublished photographs, maps and plans.